Lawd, I can't believe I haven't bragged about Rachel Stewart yet. I remember first finding her site from Clutch Mag and falling in love. Like OMG...how does someone's online presence radiate like that? I really want to be her friend in real life because she seems THAT dope. And the sista is talented. The gorgeous headband that I am rocking was made by her. 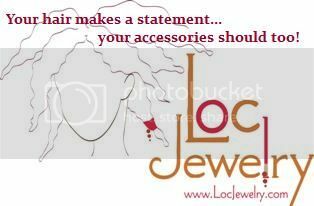 Check out her blog here for other beautiful pieces of jewelry and hair wear. Tell her B from LocRocker sent you. 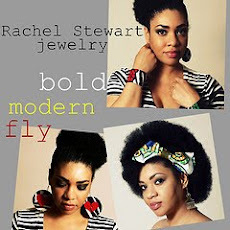 And if you're bored enough, you can check out the video where I sported my Rachel Stewart. You go, Rachel! Will continue to support and brag about you all day long! Hollers!! Lawd, yo fro is giving me life right now. LIFE!! I haven't purchased anything from her yet but I'm thinking about getting a Mothers Day gift for MYSELF!! I want the jewelry.